The inspiration for the case painting of this instrument came from designs for embroidered fabrics for Versailles by Daniel Marot. The palette is minimal: yellow and green with gold applied sparingly. All involved in the project agreed that because the walnut of the lid was so beautiful we would leave it natural, and set if off with a thin black stripe punctuated with occasional fleurs-de-lys. The soundboard painting is taken from the surviving original, and employs only the pigments available at the time. The "rose" which sits in the hole in the soundboard is also copied from the original, and is made of hand-cut parchment. It is three tiers deep, each tier consisting of two or three layers of parchment. 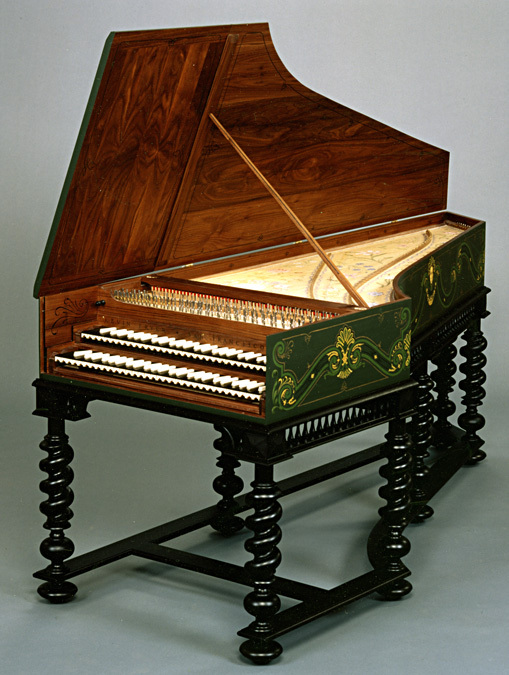 The elaborate table stand is based on a harpsichord stand which was destroyed during the bombing of Rotterdam in WWII and was designed from the only surviving photograph of the instrument. The stand breaks down completely for purposes of moving the instrument. Each leg unscrews and is then fitted horizontally inside the apron. The stand was built by San Francisco woodworker Matthias Murer.